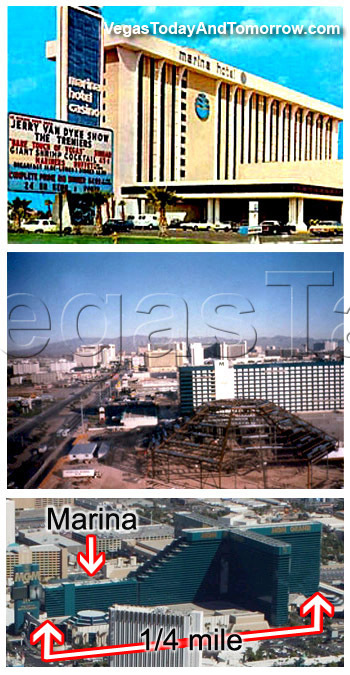 The 714 room Marina Hotel and Casino opened in 1975 on Las Vegas blvd at Tropicana (top). In 1989, MGM bought the Marina hotel and demolished all but the rooms building, which is seen here getting a new emerald skin (middle). In 1993, the MGM Grand opened with 5005 rooms as the worlds largest hotel. Few realize that the old Marina hotel is still there. The length of the hallway from the front of the old building to the back of the new building is just short of 1/4 mile long. See why I like smaller hotels.